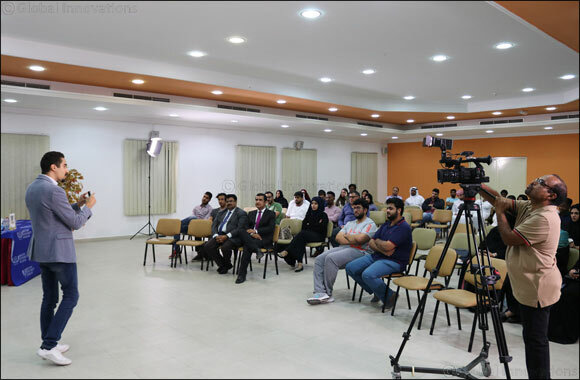 Dubai, UAE, March 22, 2018: Skyline University College Corporate Affairs Office has organized the 11th edition of CEO Lecture Series with keynote speaker, Mohamed Amine Belarbi, Co-Founder and CEO of VUL9 Security Solutions on March 14, 2018. As the featured CEO, Mohamed Amine shared how he started as a serial entrepreneur who created his own publication and co-founded the fastest-growing cybersecurity company in the region at a young age. He imparted motivational insights to the students based on his own experiences during his talk entitled, “Unleash the Entrepreneur Within.” He also encouraged students to get out of their comfort zones, to always work smartly, and to build their profiles in order to be visible in the online world where they can connect with and influence people. Mohamed Amine’s eloquence in pursuing his passion and inspiring the young generation of today has put him in the spotlight by having been featured on the cover of Forbes Middle East at the age of 24.